For the second consecutive year, Timberline High School is back in the Class 3A state football quarterfinals. 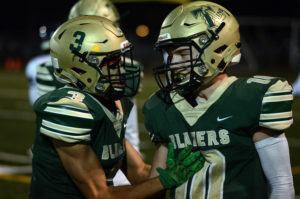 Senior dual-treat quarterback Hunter Campau accounted for 256 total yards of offense and two touchdowns and junior kicker Mason Joubert hit a game-winning 21-yard field goal as the eighth-seeded Blazers knocked off No. 9 Mount Spokane, 22-20, at South Sound Stadium on November 9 in the first round of the state playoffs. Timberline (9-2) will face top seeded Eastside Catholic (9-1) in the quarterfinals on November 16 at the Seattle Memorial Stadium. Kickoff is set for 7:45 p.m. 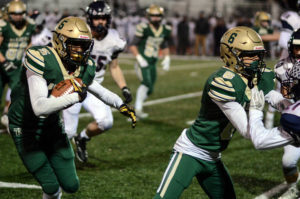 The Crusaders, who won state titles in 2014 and 2015, defeated Lake Washington, 42-7, in the first round to notch their ninth straight victory. The Blazers and Eastside Catholic have some recent history on the gridiron. 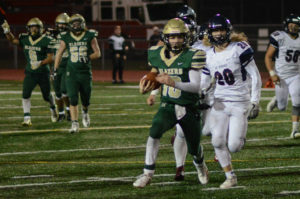 Two years ago, the Crusaders defeated Timberline, 39-21, in the opening round of the state playoffs in a game filled with miscues by the Blazers. In that game, Eastside Catholic scored the game’s final 18 points, scoring on an interception and a kickoff return and adding two safeties to pull out the victory. “Last time it was a close game. We’re definitely going to be underdogs, but we have a lot of confidence and we’re not scared of playing anyone,” Campau said. Campau, a fearless undersized 5-foot-9 quarterback who can beat teams with his arm and legs, continued his stellar season in the win over the Wildcats (8-3), throwing for 131 yards on 8-of-13 accuracy and carrying the ball 25 times for 126 yards and two touchdowns. 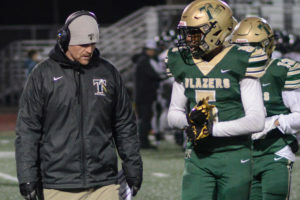 Campau paces the Blazers ground game with 1,368 yards and 20 TDs and has thrown for 1,322 yards and 14 scores on the season, but his biggest attribute maybe the way he leads Timberline as he is 19-3 as a starter. Trailing 6-0 midway through the first quarter, Campau scored on a 3-yard touchdown run to even things up before Joubert’s PAT gave Timberline its first lead of the contest. It would be the only successful PAT the Blazers would connect on as Mount Spokane would blocked Joubert’s next two attempts. The first block came after sophomore Noah Cunningham’s 21-yard scoring scamper late in the second quarter tied the game at 13. The Wildcats responded by returning the ensuing kickoff 81 yards for a touchdown, giving them a 20-13 at the intermission. It would be the last points Mount Spokane would score as Timberline’s defense tightened in the second half. Campau added a 2-yard rushing touchdown in the second quarter, but once again the PAT was blocked, preventing the Blazers from tying the game. After long runs by Campau and Cunningham, Timberline marched inside the Wildcat 5 before seeing the drive stall at the 4 with 4 minutes to play. 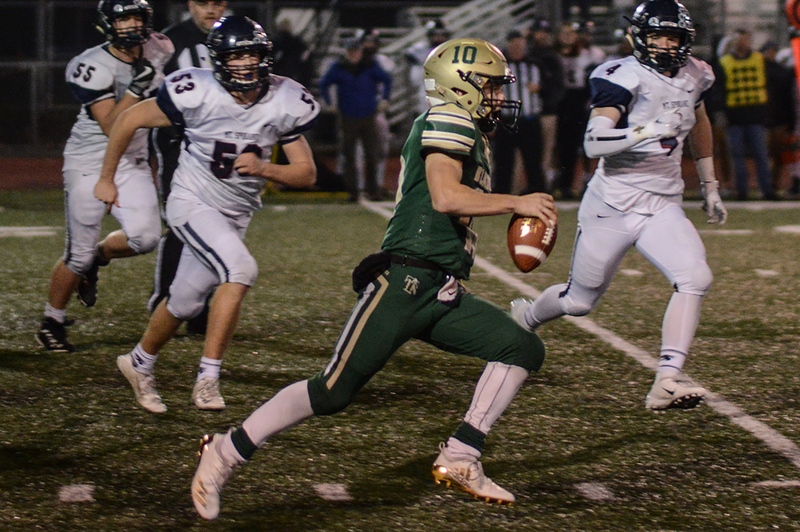 Despite seeing the two previous PATs swatted away by Mount Spokane, Mullen sent Joubert onto the field for what would be the game-winning field goal. Joubert’s boot initially hit the left upright before bouncing through, giving the Blazers’ a 22-20 lead. “I don’t know what to say. I’ve never seen that happen in a game I’ve coached before,” a surprised Mullen said about Joubert’s successful kick. Campau and his teammates apparently have a thing for dramatic first-round victories. Last year Campau threw a 27-yard touchdown pass with 6 seconds left in the game to push the Blazers to a 26-22 victory over defending state champion Kamiakin.